I'm actually kind of nervous to announce this. I thought awhile about even posting about it, but honestly, this is a huge goal of mine, so why not share! I launched an Etsy shop Sunday, April 22. Woohoo! After about three solid weeks of working my 8-5 job on top of prepping for my launch, staying up past 11pm every single night, and thinking nonstop about this shop, I finally have products that I'm proud of that are live for everyone to see. My Etsy shop, DigidaniCo, is a digital planner shop. 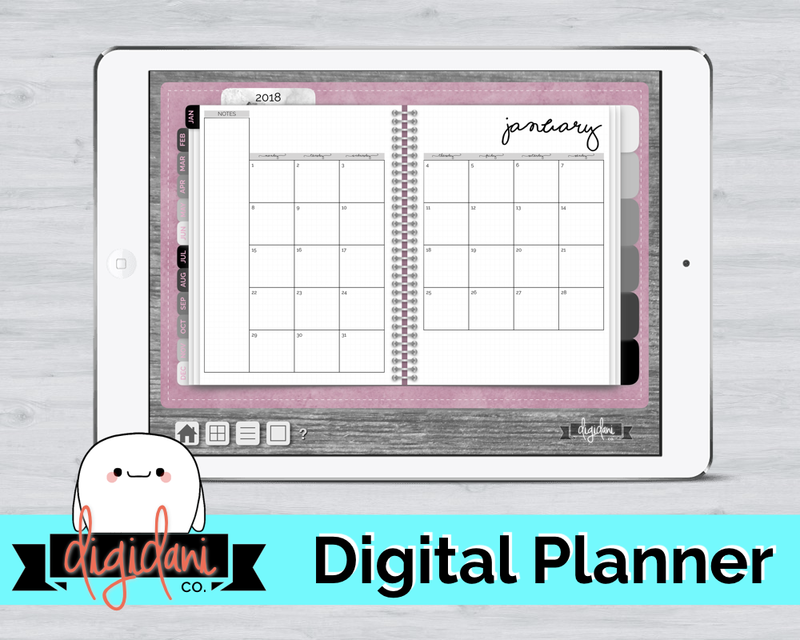 Digital planners work via any PDF reader, but are designed specifically for those who are using the new iPad and Apple Pencil to plan in apps like GoodNotes or Notability. While they work best with an iPad, they can also be used via an iPhone! Obviously larger screens will make it better for writing and functioning, but these planners would still function perfectly paired with those of you who only have your phones (like me). 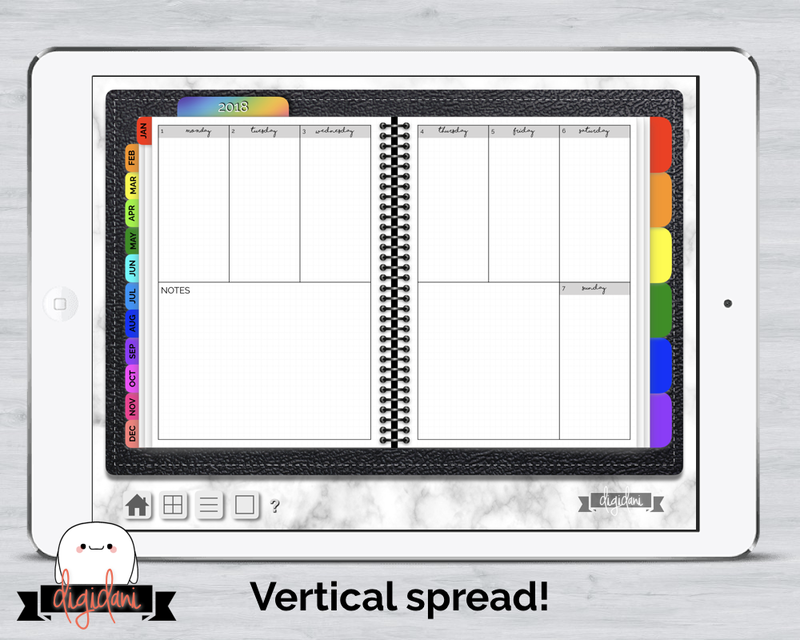 You can write on them, move from page to page via the active tabs, and add in your own stickers just like a normal planner. I've created four different styles of planners with horizontal and vertical weekly layouts, as well as a sticker pack of my signature icon--the Chubbiez! I got the idea from a video I found on YouTube one day while watching all of my typical planner videos. One girl had found a way to use her digital devices to plan in a create way! And I thought to myself--if I want to get an in on the planning community/shops then this is the way to do it. This is the planning style of the future; especially as more and more people begin to purchase the newer iPad and Apple Pencil. Many of you already know how passionate I am about my journaling and planning and scrapbooking and all that stuff, so I am so excited to be part of this new digital medium. It merges all aspects of me into one! I have plans to release new items to my shop twice a month. (Some new releases just went live today!!) These will be things like sticker packs, new paper layouts, and future planners! This coming month you can expect to see a water tracker sticker set, time bars for bullet journal style planning, a bundle of different styled habit trackers, and more. If you have a digital device you're already carrying with you everywhere, then this planner style may be perfect for you! Everyone knows how obsessed I am with planners, and I will never give up my paper planner, but I've also found that digitally planning is so fun. If you're trying to be minimal with one device then this planner is just right! All you need it your iPad or even your Phone--you can write what you need, add in pages in any part of the planner, use the custom tabs to organize your life how you want, essentially do everything you would with a paper planner except in a small compact space. I actually don't have an iPad right now, so I use my MacBook and a drawing tablet to digitally plan. And then I can also reference all of this on my iPhone! I've discovered quickly that digitally planning doesn't have to be so restricting. It can be more freeing and sometimes cheaper than physical planning too! My goals for the shop. I had my very first sale on day 2 of the shop being open! I was ecstatic and am still in shock that I've made this passion real. I have very simple goals for my shop right now as I am not entirely sure where it will go, but want to work hard to take it as far as I can. I have a newsletter that I'll be sending to all of my followers which includes sneak peaks, freebies, and discounts/early access to sales. I want to get this newsletter to 50 subscribers which ensures that I can keep this group of people in on the loop of all DigidaniCo things. If you aren't already subscribed, please do so! It would be a lot to me. My biggest goal at the moment is to bring in $200 in revenue. I think that it's a really realistic goal, and not a ridiculously high amount to strive for. I have told myself that once I reach this designated amount that I am going to invest in an iPad. This means that I'll be able to digitally plan like most, create some awesome how-to videos, and take my digital planning designs to the next level. If you're interested in supporting me and my shop then please subscribe to the newsletter and browse the current products I have. New newsletter subscribers all get an instant 20% off discount!! Let's see where we can take this Etsy shop and what we can do with it. If you have any feedback, support, questions, etc. please do not hesitate to comment down below, and I will address every single one. Newer PostLife update - I'm back! Older PostGetting my life together.